Nottinghamshire survived a final-day wobble to beat Surrey at Trent Bridge and go top of the County Championship after the opening round of fixtures. Resuming on 297-5, Surrey were bowled out for 389 as seamer Jake Ball took 5-98, with Arun Harinath adding 24 to his overnight 113. 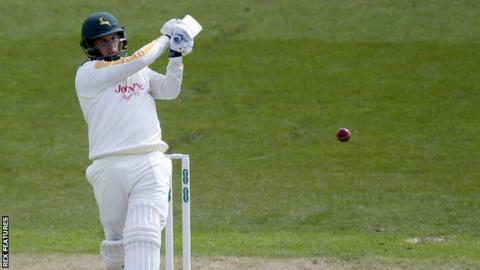 Needing 169 for victory, Notts eased to 72-0, Steven Mullaney following his first-innings 113 with a run-a-ball 42. They then fell to 100-5, but Greg Smith (54) helped seal a three-wicket win. Mick Newell's side, who were dealt a blow on Tuesday with the news of England batsman James Taylor's retirement, face Lancashire at Old Trafford on Sunday. Nottinghamshire had been in the ascendency since Mullaney's ton and half-centuries from Riki Wessels, Samit Patel and Chris Read on the first day. The visitors' hopes rested largely on opener Harinath but, after he was caught by Wessels off Jackson Bird, Ball trapped Gareth Batty in front to complete his five-wicket haul and last man Mark Footitt was dismissed for five. Notts looked to be cruising to victory with Mullaney, who struck seven fours and one six, and Smith at the crease, but Ravi Rampaul dismissed the former to spark a collapse. Tom Curran took 4-58 for match figures of 7-156, but opener Smith added 36 with Read (22) before Ball hit the winning runs an hour into the final session. "Personally, and on a team level, it is great to get off to such a good start and get the points on the board early. "We bowled exceptionally well as a unit in the first innings and I probably didn't get the rewards then, but we knew if we kept doing what we had been doing and stuck the ball in the right areas then the wickets would come. "I said at lunch that if I have to go and get my pads on I'd be pretty upset, but it's a great feeling to hit the winning runs." "The three big fellahs were exceptional and showed what a potent attack we could be if we are patient enough and do it from the first ball of the game."